Can Pets Predict the Weather, Among Other Things? Summer means it is storm season. You may not have to check with the weather service to find out if lightning is about to strike, however. The answer could be curled up in your lap or resting at your feet. According to a survey by the Associated Press and Petside.com, more than two-thirds of dog and cat owners say they’ve received weather warnings from their pets. Even more surprisingly, almost half report they’ve been alerted to bad news by their animals. Do pets really have this mysterious “sixth sense”? “It’s not that they have a sixth sense but that their senses are much more acute than those of humans,” says Dr. Nicholas Dodman, professor of animal behavior at the Tufts Cummings School of Veterinary Medicine. Hart says animals that have been frightened by thunderstorms in the past will be especially attuned to all the stimuli that accompany them. 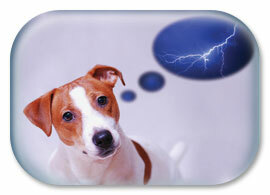 Static electricity might also play a role in an animal’s ability to “predict” the weather. How do these scientists explain a dog or cat’s reported ability to foretell bad news? He likens it to a baseball player who discovers a hole in his sock on the day of a big game. He hits a home run and wears a sock with a hole in it for the rest of his career. If it’s any consolation, however, he says that dogs and cats make wrong connections, too. “Your pet may be frightened by the smell of lamb cooking. That’s maybe because he once burned his nose on the stove and he associates that painful experience with the smell, not the hot burner. How Do Pets Warn of Impending Danger? Source: AP-Petside.com survey of pet owners who believe their animals can predict bad things happening. This entry was posted in storms., weather prediction on June 29, 2011 by yourfriends. Sighthounds are a special group of hounds that are bred to hunt by sight. The sighthound breeds include: Whippets, Basenjis, Greyhounds, Italian Greyhounds, Afghan Hounds, Borzois, Ibizan Hounds, Pharaoh Hounds, Irish Wolfhounds, Scottish Deerhounds, Salukis and Rhodesian Ridgebacks. Lure coursing tests and trials utilize a ‘lure’ (white plastic bag) strung around a course of 600 to 800 yards in an open field. 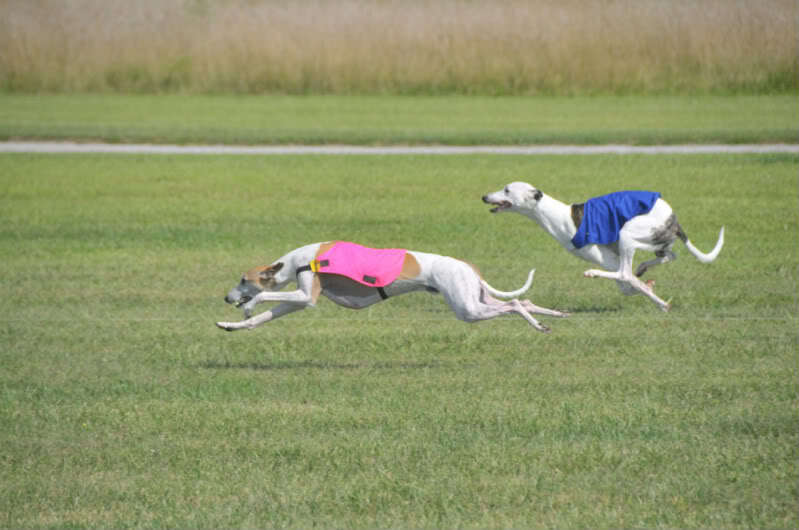 The purpose of a competitive lure coursing trial program is to preserve and develop the coursing skills inherent in the sighthounds and to demonstrate that they can perform the functions for which they were originally bred. Hounds are brought by their owners to the starting line wearing coursing blankets (bright pink, yellow or blue) and slip leads (quick-release collars). The lure is started and, at the huntmaster’s cry of “Tally-Ho!,” the hounds are released and the chase begins. Hounds are normally run in trios as judges assess performance based on each hound’s abilities, identifying hounds by their blanket color. The hounds are scored by 5 different criteria- follow, enthusiasm, agility, speed, and endurance. This entry was posted in Lure coursing, Sighthounds on June 26, 2011 by yourfriends. Provide plenty of fresh water and shade for your dog. Dogs can get sunburn, especially short-haired dogs and ones with pink skin and white hair. Limit your dog’s exposure when the sun is unusually strong, and apply sunblock to his ears and nose 30 minutes before going outside. Check with a lifeguard for daily water conditions – dogs are easy targets for jellyfish and sea lice. If your dog is out of shape, don’t encourage him to run on the sand. Running on a beach is strenuous exercise, and a dog that is out of shape can easily pull a tendon or ligament. Cool ocean water is tempting to your dog. Do not allow him to drink too much seawater. The salt in the water will make him sick. Salt and other minerals found in the ocean can damage your dog’s coat. So, when you are ready to leave for the day, rinse him off with fresh water. Not all beaches permit dogs. Check local ordinances before you begin your excursion to the beach. Start in shallow water, and call your dog’s name. You can also try to coax him in with a treat or toy – but always keep your dog within reach. 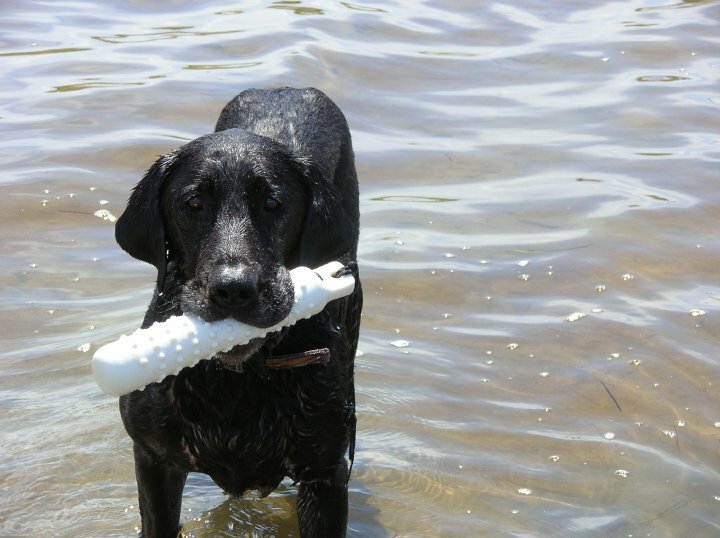 Another way to introduce your dog to the water is with a dog that already swims and is friendly with your dog. Let your dog follow his friend. If your dog begins to doggy-paddle with his front legs only, lift his hind legs and help him float. He should quickly catch on and will then keep his back end up. Swimming is a great form of exercise, but don’t let your dog overdo it. He will be using new muscles and may tire quickly. Never leave your dog unattended! You should always be in a position to help him get out of the water. This entry was posted in Beach tips, swimming on June 22, 2011 by yourfriends. 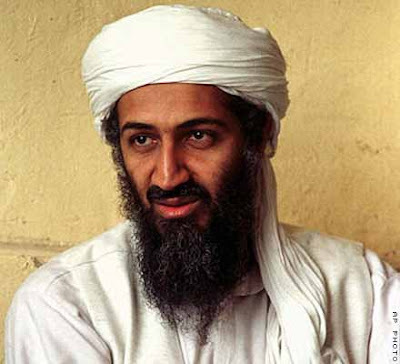 This entry was posted in Bin Laden, The New York Times on June 19, 2011 by yourfriends. WASHINGTON — Marines were on a foot patrol last fall in the Taliban stronghold of Marja, Afghanistan, when they shot and killed a lethal threat: a local dog that made the mistake of attacking the Marines’ Labrador retriever. Capt. Manuel Zepeda, the commander of Company F, Second Battalion, Sixth Marines, was unapologetic. If the Lab on the patrol had been hurt, the Marines would have lost their best weapon for detecting roadside bombs — and would have called for a medevac helicopter, just as they would for a human. An attack on the Lab was an attack on a fellow warrior. The classified canine that went on the Navy Seals’ raid of Osama bin Laden’s compound last week has generated a wave of interest in military dogs, which have been used by the United States since at least World War I. Now, more valued than ever, they are on their own surge into Afghanistan. American troops may be starting to come home this summer, but more dogs are going in. In 2007, the Marines began a pilot program in Afghanistan with nine bomb-sniffing dogs, a number that has grown to 350 and is expected to reach nearly 650 by the end of the year. Over all, there are some 2,700 dogs on active duty in the American military. A decade ago, before the Sept. 11 attacks, there were 1,800. “Most of the public isn’t aware of what these dogs add to national security,” said Gerry Proctor, a spokesman for training programs at Lackland Air Force Base in Texas, including the Military Working Dog School. 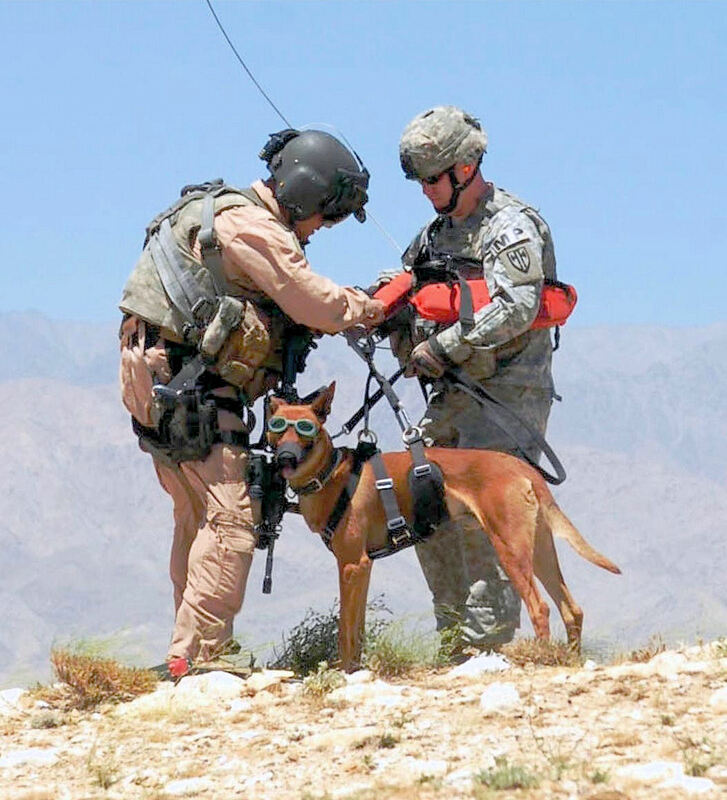 Dogs are used for protection, pursuit, tracking and search and rescue, but the military is also increasingly relying on them to sniff out the homemade bombs that cause the vast majority of American casualties in Afghanistan. So far, no human or human-made technology can do better. Within the military, the breeds of choice are generally the German shepherd and a Belgian shepherd, or Malinois, but Marines in Afghanistan rely on pure-bred Labrador retrievers because of the dogs’ good noses and nonaggressive, eager-to-please temperaments. 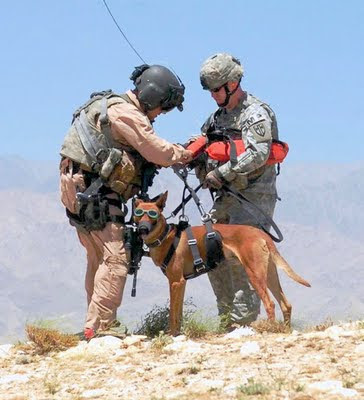 Labs now accompany many Marine foot patrols in Helmand Province in southern Afghanistan, wandering off-leash 100 yards or more in front as bomb detectors. It is the vital work of an expensively trained canine (the cost to the American military can be as high as $40,000 per dog), but at the end of a sweltering day, sometimes a Lab is still a Lab. Last spring on a patrol in Helmand’s Garmsir District, a Lab, Tango, was leading a small group of Marines on a dirt road leading into a village when the dog suddenly went down on all fours, wagging his tail — a sign that he had detected explosives nearby. The patrol froze as a Marine explosives team investigated. No bomb was found and the patrol continued, but on the way back the dog, miserable in the 102-degree heat and like most Labrador retrievers a good swimmer, abandoned his duties and leaped into an irrigation canal to cool off. But then he could not climb back up the steep bank. One of the Marines, swearing lustily, finally jumped into the canal and carried the dog out in his arms. The bonds that grow in battle between the Labs and their Marine handlers are already the stuff of heart-tugging war stories. But few have had the emotional impact of that of Pfc. Colton W. Rusk, a 20-year-old Marine machine gunner and dog handler who was killed in December by sniper fire in Sangin, one of the most deadly areas in Helmand. During his deployment, Private Rusk sent his parents a steady flow of pictures and news about his beloved bomb dog, Eli, a black Lab. When Private Rusk was shot, Marine officers told his parents, Eli crawled on top of their son to try to protect him. So far, 20 Labrador retrievers out of the 350 have been killed in action since the Marine program began, most in explosions of homemade bombs, Marine officials said. Within the Special Operations Command, the home of the dog that went on the Bin Laden mission, some 34 dogs were killed in the line of duty between 2006 and 2009, said Maj. Wes Ticer, a spokesman. Like their handlers, dogs that survive go on repeat deployments, sometimes as many as four. Dogs retire from the military at the age of 8 or 9. Few understand the appeal of dogs in battle better than Rebecca Frankel, the deputy managing editor of ForeignPolicy.com. Last week, she posted a “War Dog” photo essay, with her favorite pictures of dogs jumping out of helicopters, skydiving from 30,000 feet and relaxing with Marines. The photo essay went viral, with 6.5 million page views to date — a record for the site. This entry was posted in Afghanistan, Dogs of War on June 15, 2011 by yourfriends. ASPCA Animal Poison Control Center (APCC) experts field tens of thousands of calls each year involving animal companions who’ve had potentially hazardous contact with insecticides, weed killers and pet-toxic plants. While gardens and yards are lovely for relaxing, they can also prove dangerous for our animal companions. When designing and planting your green space, it’s a good idea to keep in mind that many popular outdoor plants—including sago palm, rhododendron and azalea—are toxic to cats and dogs. Sago palm and other members of the Cycad family as well as mushrooms can cause liver failure, while rhododendron, azalea, lily of the valley, oleander, rosebay, foxglove and kalanchoe all affect the heart. Please visit our full list—and pics!—of toxic and non-toxic plants for your garden. Many gardeners use cocoa bean shells—a by-product of chocolate production—in landscaping. Popular for its attractive odor and color, cocoa mulch also attracts dogs with its sweet smell, and like chocolate, it can pose problems for our canine companions. Depending on the amount involved, ingestion of cocoa mulch can cause a range of clinical signs, from vomiting, diarrhea and muscle tremors to elevated heart rate, hyperactivity and even seizures. Consider using aless-toxic alternative, such as shredded pine, cedar or hemlock bark, but always supervise curious canines in yards where mulch is spread. Like fertilizer, herbicides, insecticide baits, sprays and granules are often necessary to keep our gardens healthy, but their ingredients aren’t meant for four-legged consumption. The most dangerous forms of pesticides include snail bait with metaldehyde, fly bait with methomyl, systemic insecticides with the ingredients disyston or disulfoton, mole or gopher bait with zinc phosphide and most forms of rat poisons. Always store pesticides in inaccessible areas—and read the manufacturer’s label carefully for proper usage and storage. You’re doing the right thing for your garden and Mother Earth—you’re composting! Food and garden waste make excellent additions to garden soil, but depending on what you’re tossing in the compost bin, they can also pose problems for our pets. Coffee, moldy food and certain types of fruit and vegetables are toxic to dogs and cats, so read up on people foods to avoid feeding your pet. Since fleas and ticks lurk in tall brush and grasses, it’s important to keep those lawns mowed and trim. Fleas can cause excessive scratching, hair loss, scabs, hot spots and tapeworms as well as anemia from blood loss in both cats and dogs. Ticks can cause similar effects and lead to a variety of complications from tick-borne diseases such as Lyme disease, Rocky Mountain spotted fever and Babesia. Unattended garden tools may seem like no big deal, but rakes, tillers, hoes and trowels can be hazardous to pets and cause trauma to paws, noses or other parts of a curious pet’s body. Rusty, sharp tools caked in dirt may also pose a risk for tetanus if they puncture skin. While cats don’t appear to be as susceptible as dogs to tetanus, care should be taken by storing all unused tools in a safe area, not haphazardly strewn on the ground. Ah-choo! Like their sneezy human counterparts, pets have allergies to foods, dust and even plants. Allergic reactions in dogs and cats can even cause life-threatening anaphylactic shock if the reaction is severe. If you do suspect your pet has an allergy, please don’t give him any medication that isn’t prescribed by a veterinarian. It’s also smart to keep your pet out of other people’s yards, especially if you’re unsure of what kinds of plants or flowers lurk there. Keeping your pet off the lawn of others will make for healthy pets and happy neighbors. This entry was posted in ASPCA, Gardening on June 12, 2011 by yourfriends. Sometimes the best of intentions have the worst of outcomes. Lisa Fischer has seen it countless times. Saw it last week, in fact. As the head of Suburban Wildlife Rescue and Rehabilitation Inc. in St. Mary’s County, she takes in injured and abandoned birds and mammals. But what to many is an abandoned animal is to her an animal that probably should have been left where it was. That’s especially true of fawns. Last month, Lisa received two. One was an open and shut case, so to speak: It was found next to a dead doe. Without a mother, it needed Lisa’s help. The other was found in the woods by someone who assumed the mother wasn’t coming back. “They were asked to put it back and didn’t want to put it back,” Lisa said. They said the site would soon be cleared for construction. They wouldn’t tell Lisa where the site was. She’ll care for the surviving fawn and release it in September. What most people don’t realize is that a mother deer will leave her fawn alone for eight to 10 hours a day while it forages. The fawn can’t keep up with the mother. 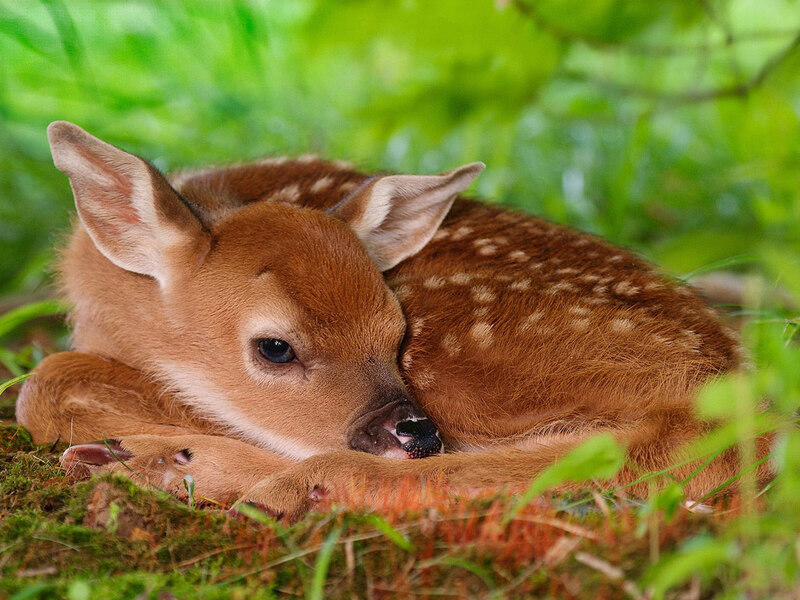 A fawn’s camouflage and lack of scent keep it pretty well hidden from predators. If the mother returns to find her offspring gone, she’ll freak out. “She will search frantically for about three days for the fawn. So the best thing is to leave them alone,” Lisa said. If the baby has flies buzzing around it or maggots on it, a wildlife rehabber should be called. Ditto if it’s obviously injured or dehydrated. Otherwise, let sleeping fawns lie. Touching a nestling or fledgling will not make its parent abandon it. Most birds don’t have a sense of smell. If you’re concerned about the bird, simply put it back in its nest. There’s another way humans mistakenly, if routinely, kill wild animals: by feeding them cow’s milk. Lisa got into rehabbing eight years ago when one of her kids found a squirrel. She earned her certification from Maryland’s Department of Natural Resources. She’s actually cutting back on her efforts. It’s expensive. What with formula and fresh food, it costs about $175 to rehab a squirrel, close to $600 for a fawn. Wait a minute. Back up. They have to be stimulated to go to the bathroom? That’s right, Lisa said. Mother deer lick their babies to get them to poop and pee, something Lisa approximates with a wet washcloth. You can imagine the results. Lisa spends a lot of time washing her clothes. This entry was posted in Abandoned, Baby Animals, Wildlife on June 8, 2011 by yourfriends. More Weird But True Facts About Animals! Blue whale babies weigh up to 7 tons at birth. A female cod can lay up to 9 million eggs. Snakes can see through their eyelids. Elephants spend 23 hours a day eating. Vultures sometimes eat so much they can’t take off again. The Amazon ‘Jesus Christ lizard’ can run across water. The biggest Antartic inland animal is a wingless fly measuring about 60 mm long. Fleas can jump up to 30 cm, twenty times their own body length. Bluebottle flies can smell meat from distances 7 km away. Many birds migrate, but the Arctic tern travels furthest. It flies from the Arctic to the Antarctic, and back again, a trip of 32,000 kilometers. Some animals can regrow parts of their bodies if damaged. Starfish can grow new ‘arms.’ Slow-worms can regrow broken-off tails. Lizards can grow new tails. One golden poison-dart frog could kill up to 1500 people with its poison. The giant squid has the largest eyes of any animal. They can be 39 cm across, which is 16 times wider than a human eye. The peregrine falcon can spot its prey from more than 8 km away. The sleepiest mammals are armadillos, sloths and opossums. They spend 80 per cent of their lives sleeping or dozing. A mayfly only lives one day, but a tortoise can expect to live 100 years. Stegosaurus was one of the most famous of the dinosaurs and was an impressive 9 meters long. But its brain was the size of a walnut. This entry was posted in True Facts, Weird Facts on June 5, 2011 by yourfriends. Many common plants can cause your dog to have an allergic reaction if ingested. While symptoms range widely in severity, some plants are more toxic than others and are so highly poisonous they can be lethal. If you have any of these plants in or around your home, it is very important they be kept away from your pet. If you suspect your pet has ingested a toxic plant, contact a veterinarian immediately. Aloe vera plants have thick, waxy stems that retain water. They are very sensitive to cold temperatures and are often grown in containers as houseplants. 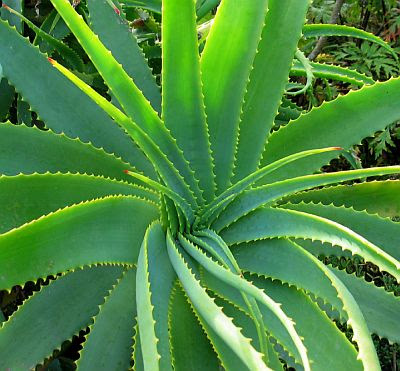 Dogs are highly allergic to aloe, and any aloe plants should be kept in a location where your dog does not have access. A dog that has ingested aloe can show several symptoms including vomiting, diarrhea, tremors, anorexia, depression or change in urine color. Contact a veterinarian immediately if you think your dog has ingested aloe. Begonias are a common plant used in flower beds and container gardens. While they are an attractive plant, they are toxic to dogs. There are over 1,000 species of begonias, but all varieties have waxy leaves and compact, dense foliage. Flowers are available in many colors, but all will have a bright yellow center. Ingesting a begonia causes oral irritation in dogs. Signs include burning and irritation of the mouth, tongue and lips; excessive drooling; and difficulty swallowing. Begonias can also cause vomiting. This attractive and popular garden plant can be deadly to your dog. There are over 50 different species of daffodils and ingesting any of them could make your dog very sick. Daffodil blooms have a trumpet-shaped structure sitting on a star-shaped background. Flowers are typically yellow in color, but can be white, orange, pink or green. Leaves, stems and flowers can cause allergic reactions; however, the daffodil bulb is the most poisonous part of the plant. Symptoms of daffodil poisoning include vomiting and diarrhea. Ingesting large amounts can cause tremors, low blood pressure, convulsions and cardiac arrhythmia. There are over 250 species of rhododendron; other common names include rosebay and azalea. The plant is highly toxic to dogs, and ingesting just a few leaves can result in severe allergic reactions. Rhododendron contains a toxic component called grayantoxin that interferes with skeletal muscle, cardiac muscle and nerve function. Symptoms include loss of appetite, diarrhea, excessive drooling, colic, loss of coordination, stupor, paralysis of the legs and a weak heart rate that can last for two or more days. If left untreated, your dog may become comatose and die. This entry was posted in Toxic plants on June 1, 2011 by yourfriends.